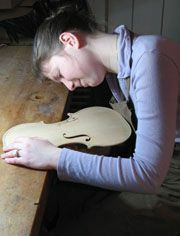 1 Bartholomew Street West, Exeter, Devon, EX4 3AJ, U.K.
Rebecca found her vocation as a violin maker at the remarkably early age of ten. Starting her first instrument when she was 13 years old with a local violin maker, she went on to study with Juliet Barker at the Cambridge Violin Maker's Workshop. Rebecca studied Art at the Colchester Institute before attending the internationally acclaimed course in Violin Making and Repair at the Newark School of Violin Making. After working in a busy repair workshop, Rebecca returned to the Cambridge Violin Maker's Workshop in 2004 as a teacher and restorer. Rebecca is now established as an experienced professional maker in her own right, and enjoys making instruments in both baroque and modern setups. She continues to actively participate as an orchestral viola player. Jonathan started his studies at the Newark School of Violin Making by studying Baroque and Renaissance stringed instruments, both plucked and bowed. In the intensely enthusiastic environment of Newark's violin making workshops, he decided to extend his studies to include the internationally respected course in Violin Making and Repair. 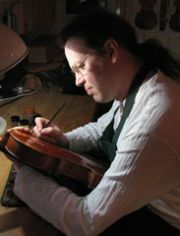 Jonathan went on to work at the Newark School of Violin Making, including lecturing part-time. He has also run a well regarded workshop in Canada, and managed the workshop at Evans-Pughe Strings in Hitchin as an official restorer for the Benslow Music Trust. Jonathan's restoration skills are in high demand, and he has enjoyed working on many fine old antique instruments. When not restoring older instruments he continues to make new ones, in recent times collaborating with Rebecca on a joint project.